It's About TV: Billy Graham, R.I.P. Is it possible to know someone not by who they are, but by who they aren't? Billy Graham wasn't the faith-healing huckster Oral Roberts, who lived lavishly and once told people God was holding him hostage to get them to contribute more money. He wasn't the Elmer Gantry-life Jimmy Swaggart, who married a 15-year-old and dallied with hookers; he made it a point to never be in a room alone with a woman with the door closed. He wasn't Jim and Tammy Faye Bakker; he never served time in federal prison, nor was he associated with industrial-strength cosmetics. He wasn't Joel Osteen, preaching the prosperity gospel in a megachurch that used to be a professional basketball arena; in fact, he never pretended to be a pastor at all. He was a preacher, who always sought advice from his own pastor. He didn't run for president like Pat Robertson; instead, he counseled them. He didn't have his own television network, he didn't live in a mansion, he never was implicated in personal scandal. That was who Billy Graham wasn't. Who Billy Graham was was a man who appeared 60 times on Gallup's list of the world's most admired men, who integrated his own crusades in 1953, who preached with Martin Luther King Jr. and once bailed him out of jail, who sold out Madison Square Garden in New York for 16 consecutive weeks 1957, who understood the power of radio and television and used it successfully in a way few ever have. (His radio program, Hour of Power, continued for 60 years.) As a dynamic speaker who could mesmerize television audiences as well as those viewing him in person, he was rivaled - perhaps - only by another evangelist, Archbishop Fulton J. Sheen. 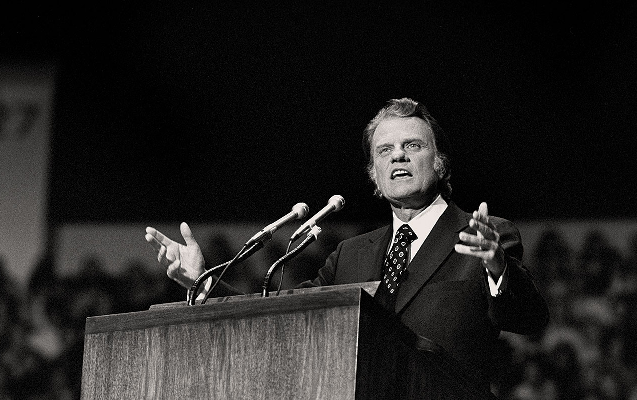 Let's talk a bit more about Billy Graham and television. Those sold-out crusades in New York City in 1957 were telecast on ABC, Saturday nights from 8:00-9:00 p.m. Today, it would be unthinkable to see such programming on a national broadcast network, but it was the first of four times Graham would appear regularly with his crusades on ABC over a two-year span. Later, when the networks banished such programs from their their regular lineups, Graham would appear on syndicated broadcasts carried by massive numbers of network affiliates; those stations, who would gladly preempt network programming in order to gain advertising revenue, carried Graham's crusades commercial-free. Granted, the time was bought by Graham's organization so it wasn't as if the stations were being totally altruistic, but neither were they ignoring that which appealed to their viewership. I don't know how many people came to Billy Graham through television, who found their way to a relationship with Christ that changed their lives; I think you could plausibly argue that he had a greater direct impact on his viewers than any other star of any other television program that has ever been shown. Although he didn't preach my particular brand of Christianity, I would sit mesmerized listening to the man speak, and seldom heard anything I could disagree with. Watching the young Graham preaching from the Garden, there is a power, a magnetism, a fire, to his words that is almost astounding - if you've only heard Graham in his later years, even in the '70s when he'd become somewhat less the revivalist preacher, you owe it to yourself to look up one of his sermons online; his own website has many of them, and be reminded of the power of speech. For many years, Graham was associated with the Twin Cities, his headquarters being in Minneapolis, and he appeared here with his crusades several times, but I saw him in person only once, in the '90s when he was older and more frail. So unassuming was he that when he took to the podium to speak, not everyone realized it at once. But when he did speak, it was as if time had stood still, perhaps even wound its way back a decade or two. Standing there preaching about Christ and salvation, his face was animated, his voice strong and clear, and it was obvious that during a half a century of preaching, the externals may have changed - the celebrities who appeared with him, the hairstyles, the clothing - but the message never changed. I don't know if this is true, but I seem to recall that in the late 1980's/early 1990's (during the height of the TV preacher financial scandals), "20/20" supposedly did a piece on the finances of major TV preachers and that Billy Graham was the only one investigated who fully cooperated, opening-up all his financial books to the "20/20" crew and telling his financial men to give the '20/20" people anything they wanted and not to hold anything back! Billy Graham also has a unique spot in Australian TV history. The coverage of his 10-day 1969 crusade in Melbourne was considered the largest colour TV exercise in Australia to date, as Melbourne's Channel 0 had shipped in $1 million worth of equipment including cameras borrowed from a Canadian TV station, to produce four one-hour programs that would be syndicated to 600 stations across the United States, reaching an estimated audience of 50 million. Apparently the specials did go to air in Australia later in the year but would have been broadcast in black and white despite the colour production. Encouraging and edifying essay, Mitchell! Great to hear you are a fellow Christian. I too grew up in the 1970s watching Graham Crusades on TV, crushing on Evie and even enjoying the classic hymns belted out by Bev Shea (which I enjoy and appreciate even more now). As you noted, Graham was an evangelist, not a pastor, and he preached a straight salvation message. Unlike many of the other televangelists who sought to woo people into supporting their organizations, Graham encouraged local churches to shepherd and provide a safe harbor for the new believers. My admiration for Graham waned over the years as it he compromised with the world and tried never to ruffle feathers lest he lose his plum post as the spiritual advisor to presidents. I read his books and resented learning later they were ghostwritten. BUT... I can't deny he was an integral part of my spiritual journey. Graham Crusades are as much a part of my TV-steeped youth as STAR TREK and THE SIX MILLION DOLLAR MAN. Thanks for posting this thoughtful tribute. Excellent article Mitchell! I am going to copy part of this if you don't mind for another website I'm on where the comments for the good Rev. Graham have been not always so admiring of the man. Like so many I was greatly influenced by his ministry. And so...eternal rest grant to him O Lord and may perpetual light shine upon him. Amen. I never put the man on a pedestal (I gave the same side-eye to Mr. Graham as I do to ALL politicians, no matter the party), but no matter if I believed what he was saying or not--I LISTENED. I listened to how he could hold an audience spellbound, how he'd command the stage, how he'd make sure that all eyes were on him without seeming like a ham. I cannot think of a televangelist today (except Joyce Meyer) that can hold my attention, and she holds it in a different, more "folksy" way. However you felt about the man (and religion, etc. ), the ability he had was lightning in a bottle!